Dear residents and Seletar Camp admirers, happy new year 2008! Although this is slated to be our last, we are determined to make the most of this beautiful environment while it is still here. But first, the bad news. It has always been our policy at the Seletar Chronicle to look on the bright side of things – because there always is a brighter side. However, we can’t overlook the bulldozers creating a hill of mud over on the golf course, nor at the site of the demolished hangar next to Haymarket. And now a couple of other serious things have so continuously been brought to our attention that we felt it necessary to write about them. The other bad news is also a police case. Since last year, the Chronicle has had several calls and has heard rumours of other cases concerning someone who has been stealing underwear from Seletar Camp washing lines. It might sound harmless to you, until you think about someone watching your house and coming into your garden, perhaps when you are alone in the house. Again, the police have been alerted, but we ask all residents to keep an eye out for an odd individual with a perverted interest in these items. And now for the good news – phew. Many residents enjoyed a wonderful new year party in the camp – where better to celebrate the new year. Going around the camp that night, it was delightful to see all the lights and gatherings in gardens and the merriment. Xavier and Sue’s joint party at Haymarket saw all generations hopping onto the dance floor, and the champagne flowed! This was the night for celebrating exuberantly the wonders of Seletar. The night was clear and breezy and the stars were visible in our broad sky. And residents gave one another especially meaningful hugs – how much longer will our community be allowed to stay together, we wondered. We also welcomed Graham and Michelle of Haymarket, who have come to live in the camp for this last year. To keep up the exuberance, and to show all those not living in the camp what a fine place this is, we’ve lined up quite a few events for 2008, which you will be hearing about shortly. Two dates to mark on your calendar will be Chinese New Year, when we’re planning another big garden party at Xavier’s or Sue and Oliver’s, and an Easter weekend with fairs, walks, talks and competitions. If you’d like to take part in either, do get in touch and let us know. Tel 91057778. And last but not least, we would like to remember those residents we have lost in 2007. Those who, because of the changes – the end of the camp as we know it, and those whose rents were vastly increased during the price hikes. And especially those who left on their last journey, dear Khattar and John, both of whom felt that Seletar was their real home. Our thoughts are with their families during this painful time. Be comforted knowing that so many people in the camp had great affection for them. 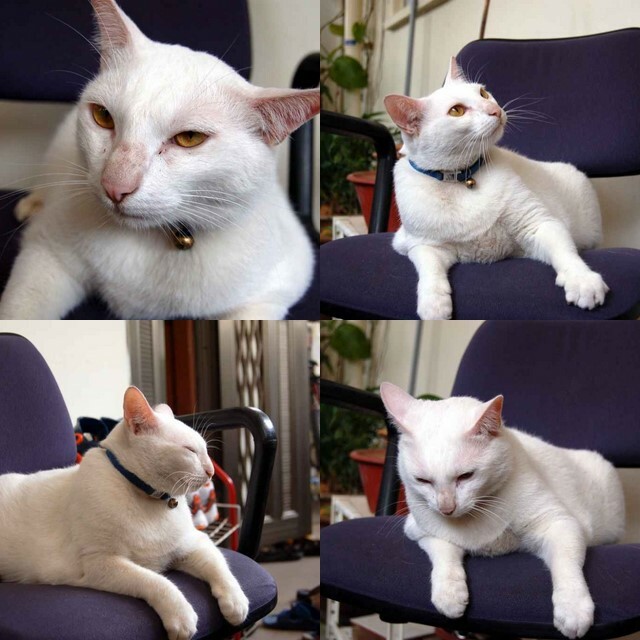 Lost Cat – Help Milky Get Home! This is a great time of year to see birds in Seletar! The Nature Society will be hosting another bird walk on 16th December, from 8 to 11 am. Meet at the car park of the former Seletar Airbase Golf Course. For more details, please contact Dr.Ho by email or on 64571196. Browse and purchase new and pre-loved items from local artists and creatives. Get great Christmas presents while supporting the local arts and creative community! Come dressed festive, bring a bottle and if you can a musical instrument. We are catering food, but if you’d like to bring a dish, we’d be happy! Looking forward to all the December fun – see you there! Welcome to the Seletar Chronicle Online! For all of you who made it from the paper Chronicle to the online Chronicle, Welcome! Yes, this site is decidedly primitive at the moment, but give me December to set up the necessary stuff so that you can advertise here for free. In the meantime, do add your comments and suggestions. And tell us if you can come to the 2007-2008 New Year’s Eve Party! While googling information on the Malay Annals the other day, I stumbled upon the story of Parameswara, the Majapahit prince who came from Palembang. Prince Parameswara, described by poet and author, Daren Shiau as the Macbeth of Singapore’s history (rather like Richard III of England too), came from Palembang. After various disputes, he fled Sumatra and asked for refuge in Singapura. The Raja of that land was delighted to meet another Sumatran prince and welcomed him with open arms. At that time, the king’s fort was on Bukit Larangan (Forbidden or Protected Hill), or Fort Canning, as it was later called. Parameswara took the Raja’s open hospitality literally, and helped himself to one of the King’s concubines. One day the Raja came in and found them together. He was naturally outraged. Parameswara is said to have drowned the king in a bowl of water. He then fled the palace. And where did he go after that? The Malay Annals record that he fled to Seletar. What was Seletar like in those days, we wonder? The earliest references to Seletar state that the name refers to native coastal dwellers (called Orang Laut or Orang Seletar) who resided on the edge of the Johor Straits and at the mouth of the Seletar River. The Orang Seletar were hunter-gatherers in a land which was principally mangrove swamp (yes, the British had to do a lot of draining, and still bits of the camp get very soggy!). In Chinese, Seletar is koon kung (“naval base”). This may more properly refer to the west bank of Seletar River on the Sembawang side. So did Parameswara stay with the Orang Seletar when he fled here? Some time after, he left Singapura and went off to found Malacca. Now supposing he’d met the mousedeer in Seletar instead and set up his trading post here? Welcome to the first issue of the online Chronicle! For those of you new to Seletar Camp, the Seletar Chronicle was set up in November 2003 to help the residents find out what’s happening in our community and to meet other residents. The Chronicle is written by residents for residents, and we welcome all your contributions. Halloween is fast approaching and the huge new Hunter’s Moon has put us in the right mood for howling. This year, we won’t be having a party at Hamilton Place, as Halloween falls on a weekday. However, there will be groups walking around looking for tricks or preferably treats. Hang something appropriate on your gate if you welcome ghoulish visitations. November 2nd sees Singapore’s very own wildlife stampede, which starts in the Botannical Gardens. Do attend if you can, and have your say about Seletar’s wildlife. Jane Goodall will be there, and many Singaporean nature lovers as well. How about celebrating our last New Year all together this December 31st? We have plans for an interesting location in the Camp, which will be perfect for our get-together. Everyone can come, residents, friends, family…! Email me if you’d like to find out more. We’ll be making announcements once we have the venue confirmed. Look out for more events and activities happening around the Camp. Please send us details of anything you are planning something. Also, advertisements are also welcome. The Chronicle has been a source of Camp news for quite a few years, and in response to popular demand, we are making past issues available online. Enjoy!